During the visit, Professor Sultan Abou Orabi, on behalf of Association of Arab Universities and Professor Antony Chapman, on behalf of Cardiff Metropolitan University signed a memorandum of Initial Agreement to host the Arab and European Leadership Network for Higher Education, (ARELEN). The network is an outcome of the Tempus Leadership in Higher Education Management project, coordinated by Professor Mohamed Loutfi of Cardiff Metropolitan University in association with the UK Leadership Foundation for Higher Education. The joint hosting of the network with AArU, a prominent regional organisation, will help to ensure a sustainable outcome for the project in the Middle East and North Africa (MENA) region. Cardiff Metropolitan University's Vice Chancellor, Professor Antony Chapman said: "We were delighted to welcome Professor Orabi as a representative of the AArU, and look forward to continuing to build on the strong links between our institutions." David Lock, Director of International Projects at the UK Leadership Foundation for Higher Education, who witnessed the signing, welcomed the agreement as a sustainable output from the TEMPUS project. He said: "Both British and Arab universities stand to benefit greatly from the resulting leadership opportunities". Professor Orabi was also given a tour of the new Cardiff Met facilities during the visit, including the state-of-the-art Cardiff School of Management building as well as Cyncoed Campus with its cutting-edge NIAC athletics site. 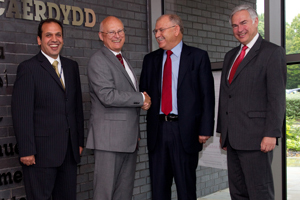 Commenting on the partnership, Professor Sultan Abou Orabi said: "The Association of Arab Universities is delighted to be in this unique relationship with Cardiff Metropolitan University with its extensive links in the MENA region and its global partnerships in ASIA, Europe and the Middle East. We at AAU are looking forward for our future collaboration with prestigious Cardiff Met and its visionary leadership in internationalisation"